It is WAHM Wednesday! Today we are going to meet Heather from “For the Love…” She said she was in the habit of saying “For the Love…” whenever something crazy happened and it just stuck. She sells her products for the love of creativity on the Creatively Serene Congo. Heather sells unpaper towels, which are fabric paper towels. It saves the earth because you are not using paper products and it saves money because you are not having to buy paper towels. You can use anything as an unpaper towel. But, Heather’s ingenious design allows me to use my unpaper towels all the time, even when I have company! They are so pretty and handy that instead of getting questions I get compliments! When I bought my unpaper towels Heather was the only one who was selling this wonderful design. Heather has always been creative with her designs. She usually does not even use patterns when she sews! She said she has been sewing since she was a Freshman in highschool. One of her early projects was making jeans and a flannel shirt for her dog (before clothing for pups was popular). She designed the pattern and made the outfit! She had seen unpaper towels, but couldn’t help thinking that there must be an easier (and more decorative) way to use them. She had just gotten her snap press and the idea blossomed from there! Heather’s unpaper towels snap together and the very first one snaps onto a paper towel roll. 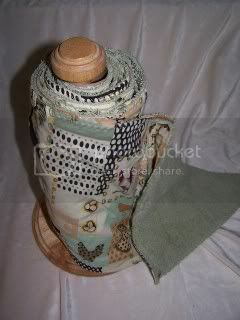 Tada – you have a “real” paper towel roll of cloth! Pull them out for company and let the compliments roll in. Pull them out for your own use and you won’t stop smiling when you think of the earth and money that you are saving! Heather said that after her towels were a hit she branched out and sold other products. One of her other big sellers is “mama cloth”. These are cloth menstrual pads! Again, the money and earth you can save by using them is mind boggling. Women who use these swear by the comfort and health benefits. I must say that my first reaction to “mama cloth” was probably what many of my readers are thinking right now. But, keep an open mind! When I researched cloth pads I was surprised to find that people who use them report less cramping and have shorter cycles! It turns out there are some ingredients in the typical disposable pad that makes your cycle last longer and because of that it can cause cramping. Hmm… very interesting! Heather says that the most challenging thing about her business is finding time. She has a 2 1/2 year old son and a daughter on the way! Her cart stocks on February 2nd (for those of you who are not familiar with the hyenacart world – a stocking is when the items become available for purchase). Until then, she does have previews of the items that will be for sale. Heather has offered to also host a giveaway! The winner will get a set of 3 mama pads! Those of you who just aren’t sure – this is your chance 🙂 Those of you who know you want them – then this is for you too! 1 – Leave a comment about what you love about one of her products. Remember previews are up, but you cannot make a purchase until Sunday! Good luck! Remember to visit Heather at her grand opening on Sunday! If you are a WAHP and you’re interested in participating in WAHM Wednesday then please email me at LittlePeopleWealth (at) GMail (dot) Com or use the contact link on my contact page. I would love to try the mamapads. I use cloth for my baby’s diapers but not for myself. I should start! I love how the Unpaper Towels fit on a roll and are ready to use…I’d never seen anything like before! Thanks for the chance to win some mamapads. The unpaper towels are such a neat idea! 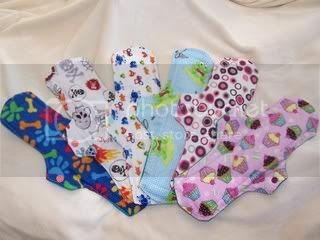 The mama pads look great too, would love to try them! i love the black and white snapping unpaper towels. what a great idea and a great way to keep them all together. I’d love to try both products. I’ve suffered since my teenage years with long periods and horrible cramping — never giving a thought about pads being the cause? Interesting! i love the mama pads! i have one set and i’d love another! I have never heard of unpaper towels but what a great idea! Hers are beautiful too, and I would love to have those in my kitchen! I have really been wanting to try cloth pads. Such a great idea! Thanks. I love the pads with the cherry fabric. So cute! Those unpaper towels look amazing! I’ve never seen them snapped like that, I might have to look into purchasing some! I have always been curious to try cloth pads; this would be great! My comment about her stuff is that I have NEVER heard of cloth paper towels, that even fit on a roll! Cool. Thanks for the giveaway! I would love to try either product. Thanks for the chance! I would love to win. I love the unpaper towels. So inventive! I also like environment friendly nature of this. I love that she offers a choice between PUL and fleece backed!! There are needs for both of them so it’s nice to be able to choose! I love the idea of those unpaper towels. Thanks for the great giveaway! I think unpaper towels that snap together are a great idea. It makes it easy for the entire family to use them. Mama Pads. Wow, never thought about that! Neat! I like paper towels too! I like that her pads are different patterns. The only cloth pads I have are all white. I LOVE the black and white snapping unpaper towels those are cuuute! I’d love to try the mama pads. I’ve been thinking about buying some for awhile, just haven’t taken the plunge. And the untowels look cool tool. I’ve didn’t even know they existed!! I like the Pink and Sage Ovals Snapping UnPaper Towels, the design is so pretty! I love Sage. I wear mama pads. They DID reduce the length and severity of my cycles! You just cannot even imagine having a 4 day cycle. Love it! I am searching for the perfect mama pad right now. I have 3 brands, and they each have their good point, but none are the exact thing I need yet. I would like to have some mamapads-I HATE when you are caught without pads, running out too early etc. I’m thinking of switching for good! Oh I love the unpaper towels!!! I really like that they fit on a roll. Thats fantastic. I’d love to try the Black and White Snapping UnPaper Towels – they are functional, beautiful, and eco-friendly. I think the Black and White Snapping UnPaper Towels would look great on our counter and would be interesting to test out. Hate wasting paper. May Canadians enter? I love how you can order the UnPaper Towels in colours that go with your kitchen. THose unpaper towels are a very neat idea! I loooove mama cloth! I don’t need them anymore, but would like to get some for my daughter. Her Pink and Sage Ovals Snapping UnPaper Towels are amazing! 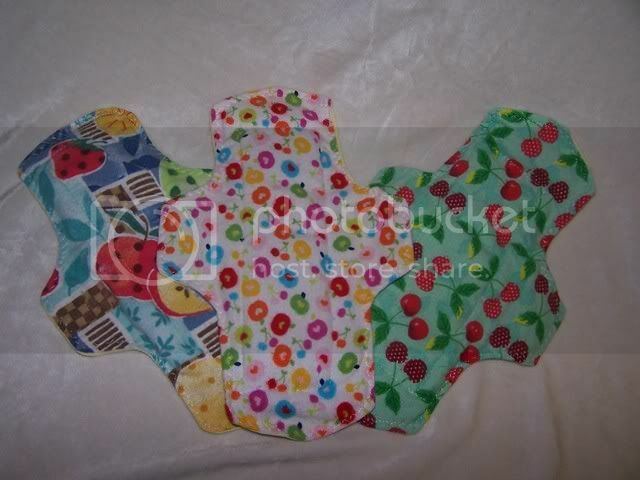 I love the cloth idea.I would love to try the mama pads. I t save money and seems it would be more comfortable than the other pads. Thanks! I would love to try the mamapads! I love the mama pads! they are so bright and cheary!! I love not filling up landfills! I’d like to try the mama pads. Thanks for the giveaway! I’m in love with the idea of the un-paper towels – and they’re so reasonable priced, too! I love my mama cloth! Her patterns are so super-cute! I love the cute patterns on the mama cloth! How cute are those unpaper towels. I love them. I did not know about the option of unpaper towels, but it would make eliminating paper towels from our kitchen so much easier! I also love the custom fabric option. I love that the upaper towels work on a roll, so they’re as convenient as paper. You sold me on the unpaper, I just contacted Heather to buy some! WAHM Wednesday and a Giveaway with For the Love… | Ultimate tips to help you save money! Previous post: 60-90% Winter Clearance Items – Deal of the Day!